Some kids never learn. Or at least it seems like they never learn. 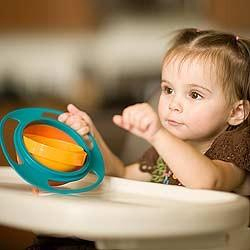 Either way, if you are a young parent sick of holding back the tears over spilled milk, check out the Loopa Spill-Resistant Bowl. Working like a gyroscope, the brightly colored bowl steadies itself whenever handled. Now when your young one picks up the bowl, the food stays on the inside and not over everything else. Of course the handles encourage your child to actually grab at the bowl, so there may be some (even greater) awkward dining moments in their teen years. By then of course, you’ll be actively condemning their choice of dates, so really it’s a win-win.